As daily temperatures are now reaching the low 30’s, we can begin to enjoy the bounty of snow we’ve received without fear of frostbite. Several snowshoers and cross-country skiers have been sighted in the Arb in recent days, as the snow is an almost perfect texture for these activities. The forecast for the next ten days predicts high temperatures to remain near the high 20’s and lower 30’s, so it appears that we may be able to comfortably enjoy this snow for a while. On Tuesday morning 1/12, the trees in St. Peter were blanketed in a beautiful silvery shimmer known as a hoar frost. This phenomenon is an example of deposition, which is the changing of something from a gaseous state directly to a solid state (skipping the liquid phase). 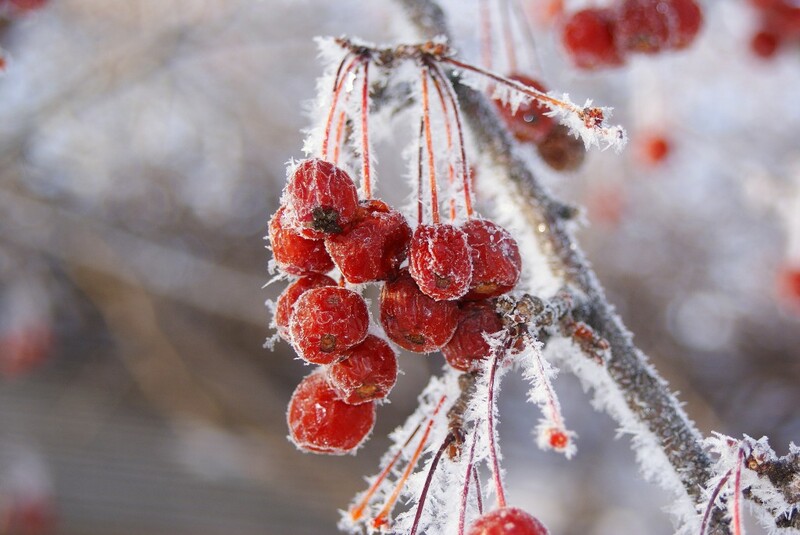 For a hoar frost to occur, the surface temperature needs to be below freezing (32 degrees Fahrenheit) and the air temperature needs to be warmer. When the air contains water vapor (i.e. it feels wet or humid), as it touches the colder surfaces it becomes solid ice crystals and forms a fine coating on those surfaces, whether they be trees, buildings, sidewalks, or stationary vehicles. Hoar frosts can appear especially magnificent during the morning hours when the sun begins to shine through the ice crystals and the entire landscape is draped in silver; such was the scene in the arboretum on Tuesday morning. Crabapples draped in hoar frost in front of Interpretive Center, 1/12/10.